Rope Access Remedial Building Services can save huge amounts of money for any organisation seeking to carry out remedial repairs to high rise buildings, or confined space and difficult access structures. Advanced Solutions Group specialise in remedial building services via rope access technique and can provide you with cost effective methods of carrying out repairs and remedial works. Currently, one of our many running projects is a large residential site in Camperdown, where our expert abseilers are carrying out flashing fixture works by industrial rope access abseil technique. Please also see our Industrial Abseilingwebsite to find out what kinds of services we can provide in the remedial building works sector. Our expert team are in day two of installing tek screws into louver flashings on the entire building all done using industrial rope access, where our team descend the external facade using specialised abseiling equipment to drill into flashings to fasten into position. This job will require over 1000 individual tek screws….thats alot of screws….. If you have a flashing repair you need, please click the link in the yellow box to go to our web site or call 1300 789 474 to make a booking now. Our expert abseil contractors completed internal duct cleaning that require our specialised confined spaces certified abseilers to descend into the kitchen exhaust risers that have grease build up of the internal duct work and require scraping down back to steel. The team got very hot and dirty with this job they had to use full white coverall and when they returned to the surface they went from white to deep black and grease falling of them, but the job was completed sucessfully. This works had to be completed at night as the kitchen exhaust was only off when then shopping centre closed. We work closly with Enviroair for these sorts of difficult access jobs. Call us to see what we can do for you…..
ASG sucessfully completed a height safety installation for Quantum Plant equipment to access and install a motor that required a 150kg lifint point to be installed to hauling of motor. 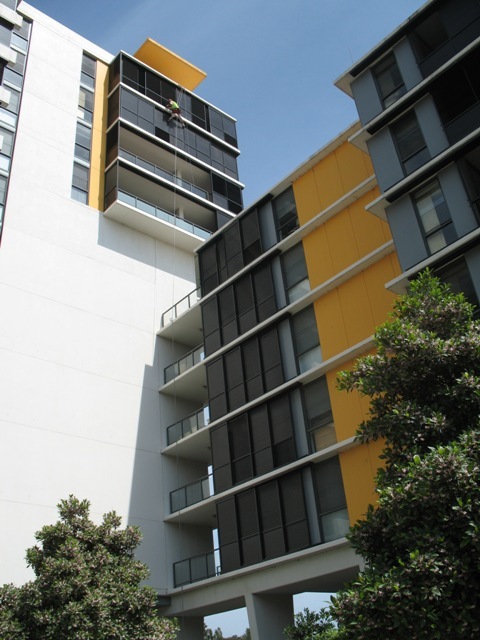 Our team of abseilers will complete stage 1 of a remedial repairs project at 484 Victoria Rd Gladesville for Dexus a division of CB Richard Ellis. Stage 1 required concrete repairs and expansion joint replacement, also the stair pods required full emerclad coating to seal the srairpod block in from water ingress. Works have been signed off by Costin Roe consulting that are the overseeing consultants for this project as we work very closely with Costin Roe Consultants for external facade remedial repair project that require abseiling access or industrial rope access technical rigging techniques to complete the required works. Completed for this project is the replacement of compromised expansion joints requiring our personnel to cut out the damaged joint with a specialisee fein cutter (a german cutting tool similar to one that is used to remove plaster casts) then re instate with new Mastic sealant. We then covered the whole stair pod with Emerclad waterproofing membrane. for more infromation please click the link in the top yellow box to go to our web site…. Advertising and Signage play a critical role in the marketing activities of most businesses. 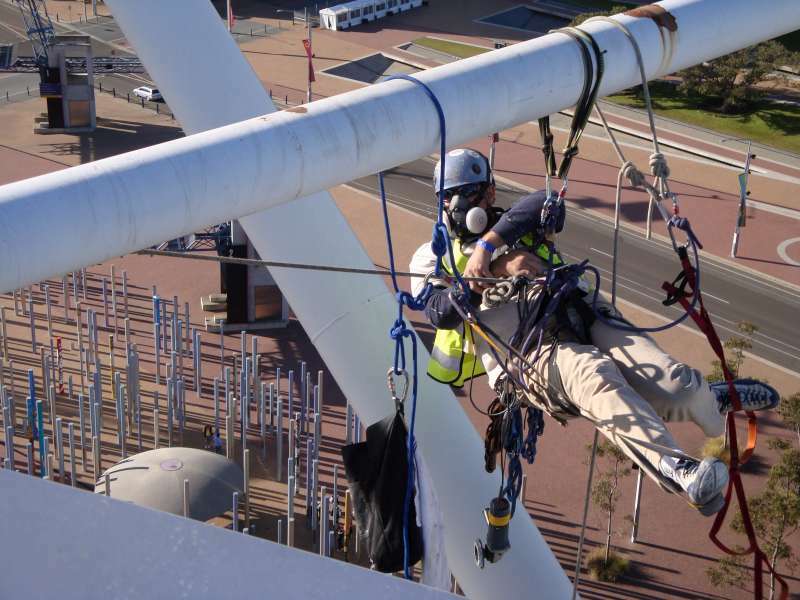 Advanced Solutions Group provides services to the advertising industry via industrial rope access, facilitating the application and removal of advertising material from buildings and billboard structures throughout Australia. Our highly trained staff are experienced in the area of provision of sign installation, billboard works, self adhesive installation and removal, in addition to many other areas of signage and advertising access applications. 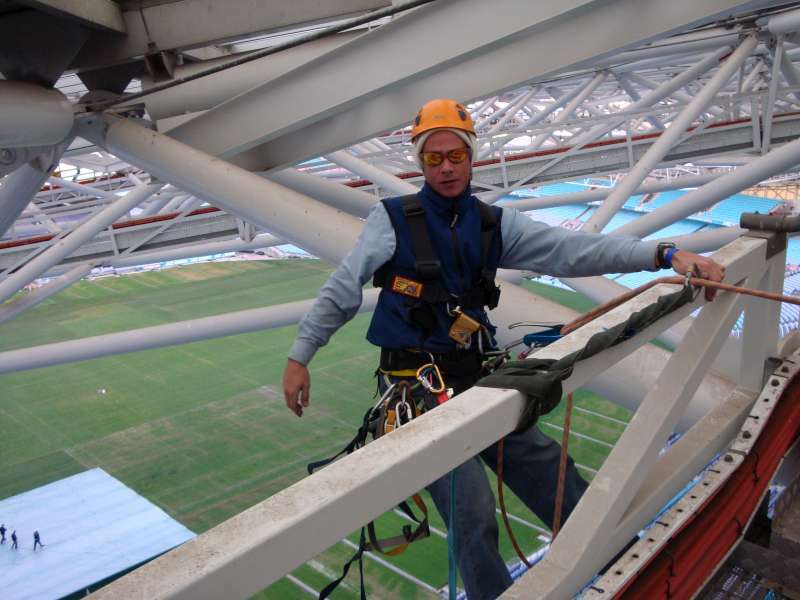 Our specialized team of industrial rope access works also commonly knows as abseil workers where we use abseiling access equipment for our experience personnel to work on the steel structure on the stadium. You can see our team at work on our home web page click the link in the yellow box in the top right side bar. We are recently in talks with a large off shore oil platform that services numerous oil platforms around the world and requires out industrial rope access workers to carry out rigging to get our team to carry out inspections and repairs to the main support struts and other pipe works on the outlet and feed lines. All our rope access workers are highly experienced in oil platform and access with minimum 5yrs experience in the field. Please contact our project Manager or director on 0414 594 965 to discuss what we can offer you.